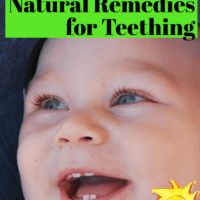 When it comes to natural remedies for teething, a lot of parents are unsure what is really effective and what is downright bunkum. The discomfort caused by teething can leave babies feeling miserable and parents feeling helpless. 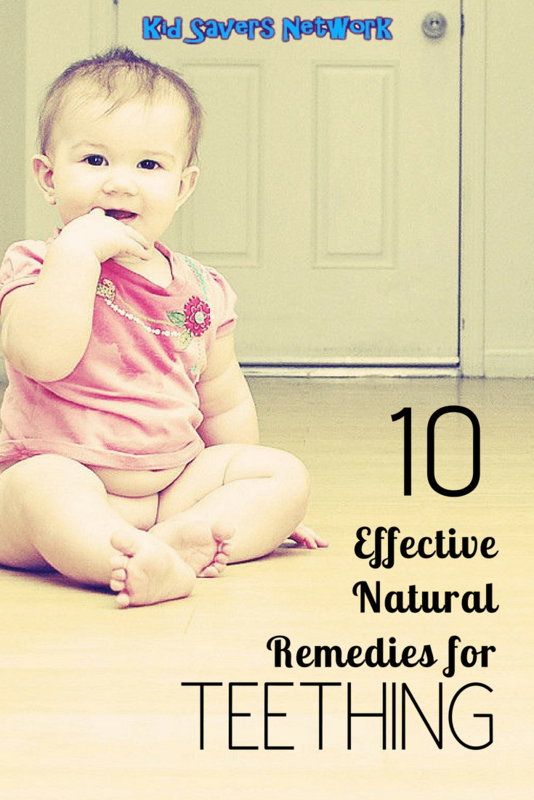 In this article we’ll give you 10 effective natural remedies for your baby’s teething pain. 3. Let them chew on a cold washcloth. 4. Try a cold meal. 5. Give them a pacifier. Teething can begin anywhere from around three months to a year old and every child handles it differently. Some lucky children (with lucky parents!) may not experience any symptoms at all while others may experience a broad range of symptoms or just a few. This can make it difficult to determine if teething is the culprit of a baby’s discomfort or not. A baby may experience only one or two of these symptoms, making it hard to tell for sure if teething is the problem. In order to rule out other possible causes of her discomfort, ensure that your infant is not experiencing any of these symptoms, which are not related to teething and could indicate an illness: diarrhea, fever, stuffy or runny nose. If your child has these symptoms and they are persistent, don’t dismiss them as a symptom of teething and consult your doctor. While there are many over-the-counter medications for teething pain, many of them contain a numbing agent called benzocaine which can be dangerous to children under 2. 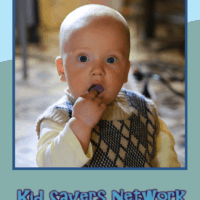 In fact, the FDA recommends that teething medicines containing benzocaine not be used by parents. 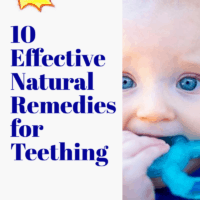 Without the option of over-the-counter medications, many parents are left wondering how to treat teething. 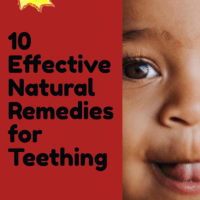 Luckily, there are many natural remedies for teething that don’t require any form of medication at all. 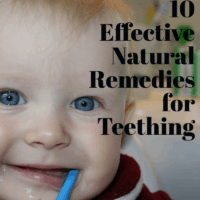 Many parents are unsure on how to treat teething pain and help their baby find relief. 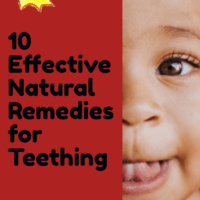 There are many ways for treating teething at home that don’t require the use of potentially harmful medication. Make sure to wash your hands and then use a finger to gently rub and massage your baby’s gums. Pressure applied to the gums can help ease the pain from sore gums. Use the rounded part of the spoon to apply cooling pressure to baby’s gums. It is important that the spoon be just chilled in the refrigerator and not frozen in the freezer, as a frozen spoon can become stuck to a baby’s mouth. Dip a soft washcloth in water or breastmilk/formula and chill it in the refrigerator until it is nice and cold – then give it to baby and let her chew on it to her heart’s content. A cold meal, such as chilled applesauce or yogurt, can help soothe aching gums while leaving her happy and full. If your baby takes a pacifier, the act of sucking and chewing on it can help ease gum pain. There are many forms of teethers on the market today – you’ll find everything from the classic teething rings to wooden teethers in friendly animal shapes. Look around and find one that works for you and your baby. Chewing on a teether can help ease pain while aiding in that pesky tooth finally breaking through the gum. Chilled fruit such as sliced strawberries and bananas placed in a mesh feeder can help soothe your baby’s gums while giving her a healthy snack – and keeping her occupied for a little while. Drinking from a slow-flow sippy cup filled with cold water or breastmilk/formula can be a great home teething remedy for the older baby. These innovative cups are spill-proof and also help develop muscle development in children’s mouths. If your baby has started solid foods, try offering a chilled peeled carrot or cucumber to gnaw on. The cooling pressure can help soothe gums. Sometimes it can help to direct baby’s attention away from the discomfort and onto something else. Try running her a warm bath or introducing her to a new game. This can go a long way to boosting an irritable baby’s spirits. We tried everything and all of the above remedies, and unfortunately for us, none of them worked very well. As every baby is unique, so are the solutions. We finally embarked on over-the-counter medications and firmly avoided anything that used Belladonna or Benzocaine, two popular ingredients that may have been linked to serious complications for babies. We finally settled on Humphreys Pellets. Our daughter readily took them, put one in her mouth, and chewed on it with her gums and got quick relief. It was amazing that she would ask for 1 or 2 more until she was comfortable, and stopped on her own asking for more. The ingredients look very simple and homeopathic to us. 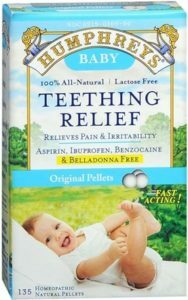 I think the combination of the mild active ingredients with the shape of the ball pellet, were the secret to teething relief for our baby. It was like a miracle for us. And to this day, from the list of ingredients, appears to be completely safe. If we had another baby, we’d definitely use this as our solution. Teething is a normal part of growing up and something we all must go through. A lucky few sail right through the experience while others struggle through the discomfort. Whichever the case with your baby, applying the tips above will help you both endure it.